I made a pretty lazy start to my stay in Calgary. I say this, I was up early enough to get breakfast. Free hostel breakfast waits for no man, no matter how much he wants to sleep. I spent most of the morning looking at ways to spend the day and found that the main sights of downtown Calgary are spread fairly nicely across the city. After lounging about for a few more hours I eventually decided it was time to head out and see what Calgary had to offer. I passed through Chinatown, thinking about lunch already but decided I’d try and save some money and grab some things from the first supermarket I came across. This didn’t happen before I reached Prince Island Park. 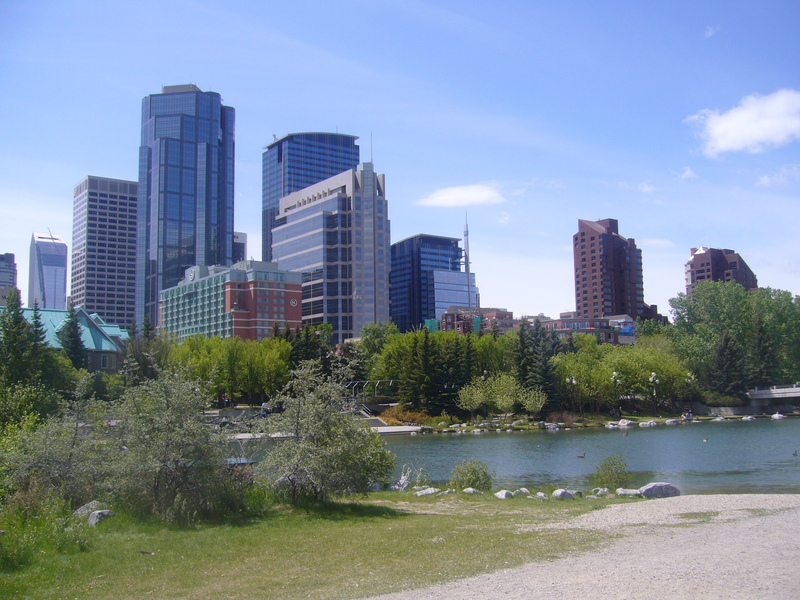 The park is situated on an island in the Bow River and is split into two halves, one forming a natural wetlands for the local wildlife and the other are more landscaped park for the local people to relax in. I was still feeling particularly lazy at this point, so found a bench near the river and got some reading done. I’ve finished the Count of Monte Cristo now, which was an excellent read by the way. I’ve been reading the works of Jack London, having recently finished The Call of the Wild and now starting on White Fang. I remember watching the animated series The Legend of White Fang as a child and really wish I had the opportunity to read the books back then as well. They are fantastically well written. Anyway, after enjoying a few chapters I decided to walk across the city centre, checking out the Eau Claire Market which is more of a mall than a market and the shopping streets of Barclay Parade and Stephen Avenue. Calgary has it’s own tower, the Calgary Tower but despite the promise of views of the mountains I decided to pass up on this opportunity to get above the city. I walked further through the city crossing the downtown tram lines. I was told at the hostel that the tram through downtown was free and you can hop on and off as you please. I can only assume this is to encourage the use of it as the area it runs through is small enough to walk through without any difficulty at all. The city is quite interesting to walk though, but there doesn’t seem to be a lot going on. However, I am under the belief that this is probably because I am comparing it to other cities I have been to that are significantly bigger and more bustling. Perhaps if I make it out to some of the surrounding areas I might find it to be a little more interesting. At this point I found myself on the south side of the city centre and I’d been told there was a Safeway nearby. Yeah, a Safeway once one of the so called big four supermarkets in the U.K. still has a foothold in Canada.I picked up some supplies to feed me there and then and to last for my few days in the city. I then headed back across the city through a couple of small urban parks before arriving back in Prince Island. I took a while walking through to find somewhere to sit and ended up talking with an elderly gentleman about his life and how he desired to go back to British Columbia. After talking for some time he left to meet with his family and I began reading again. I found myself being very appreciative of the Prince Island Park, it’s far enough away from the city for it to be relatively quiet, the Bow River is fast flowing and a beautiful colour, and the grounds are well maintained. After another few chapters I decided to head back to the hostel to sort myself out with some dinner. The following morning the weather was largely changable, flipping between glorious sunshine and torrential showers and was spent mostly in and around the hostel chatting with other travellers and the other guests on the job hunt. It’s still fascinating to experience the difference in hostel culture between Europe and North America. Out here a hostel is a temporary home in a far more serious way than it is in Europe. People could be staying in a hostel for several weeks while they find a place to live and work. By the time the afternoon had come around the weather had cleared for good and glorious sunshine beat down on us. At the time I was chatting with my two Australian room-mates, Karla and Ash and between the three of us we decided that the weather called for nothing less than a cheeky pint. 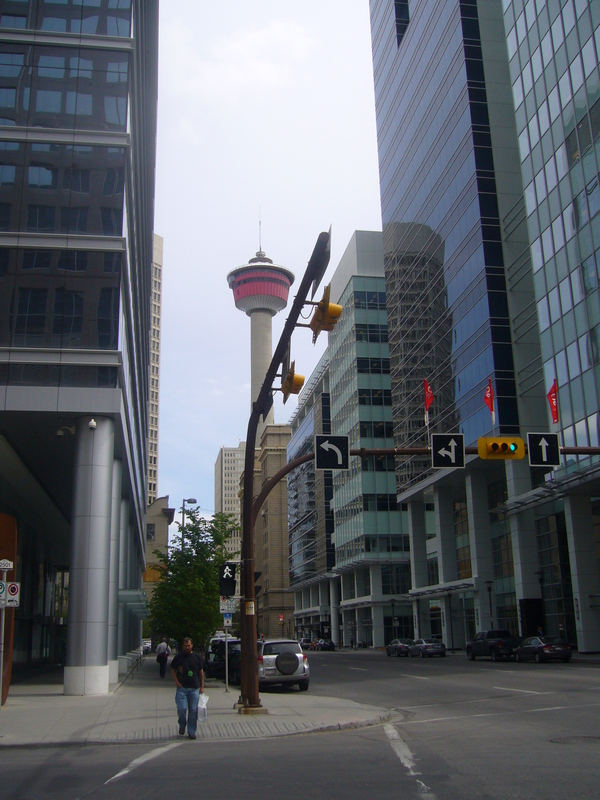 We took a walk down Stephen Avenue, the pedestrianised high street of Calgary on the hunt for a bar with a beer garden or a patio. The only one we found was an Irish pub with a small patio out on the street and every table was taken. We walked on just to be sure there wasn’t a better option before heading back with the idea of waiting inside until some people moved on. This never happened, or at least we weren’t aware of it. 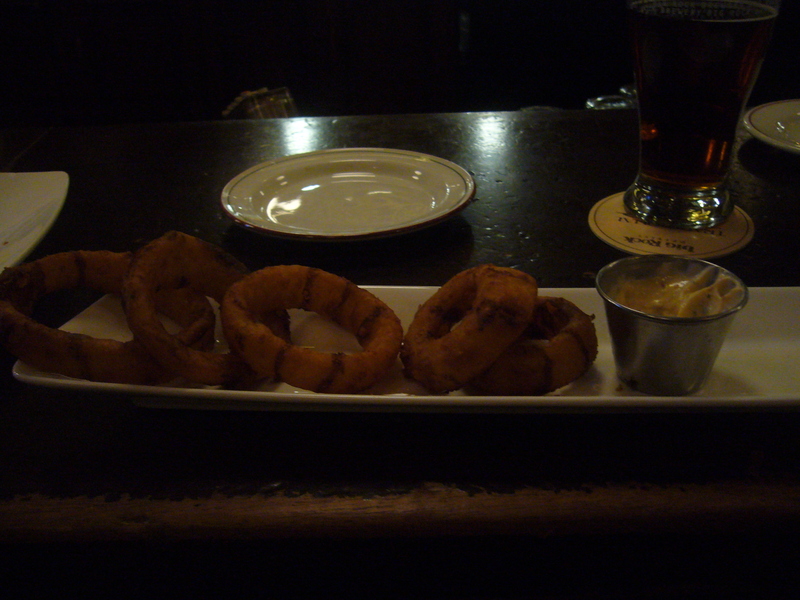 Once we got a taste for the beer it kept on flowing and we enjoyed a selection of sweet potato fries and Guinness battered onion rings to keep our hunger at bay. Eventually I came to the decision that as I had to get up at 5am, it was time to go and the three of us giggled our way back to the hostel. Once back the kitchen was our destination and we blagged our way through a dinner before passing out. Nothing like an afternoon in the pub to get you ready and refreshed for an early start.